I posted earlier this week about my IKEA Lamp Shade Makeover, showing you how to alter the shade frame with welding rods and solder. Now, here's the rest of the project - making the shade for the newly done shade. First things first, choose your fabric. I had purchased this linen print duck cloth a while back and was planning to use it outdoors, but the color and simple pattern was perfect for our bedroom. When choosing your fabric, you should make sure that it is flame resistant/fire retardant since it will be used close to a light bulb. My fabric did not say whether it was flame or fire resistant, so I cut a small piece off and tested it with a lighter. The fabric resisted the heat and the flame from a distance, and when it touched the fire, it melted, but a flame never formed. I deemed this fabric flame resistant and since it was only melting with contact to the fire, I decided I was comfortable using it for my lamp shades. Next, measure how much fabric you will need. I suggest that you add one inch to each side of your measurements just to make sure you have enough fabric to work with. Measure the height of your shade frame, then add two inches, one for each side. Measure the width of each side of your frame, add those together, then add two inches. Trace your measurements onto the wrong side of your fabric using a pencil or fabric chalk. Cut out your fabric and iron flat. Ironing will get rid of all the wrinkles and help you work with a stiffer fabric. On the wrong side of your fabric, make a mark on the two long sides where the frame of the lamp shade will end. If you added one inch to each side of the fabric, you will have marks one inch down from the top and one inch up from the bottom of your fabric. These marks will help you make sure that your hemming will still leave you enough room to cover the shade frame. Next, fold both of your long sides down and pin into place. You can either use a double fold technique, which hides the frayed edge under a second fold and only requires a straight stitch, or you can use a single fold and a binding stitch to stop the edge of the fabric from fraying. Set your sewing machine to the stitch appropriate to the type of hemming you have decided to go with. I went with a binding stitch to show you how to align the fabric with the needle since most readers will know how to sew a straight stitch on a machine. When aligning your fabric with your machine needle, you want the needle to line up just past the edge of your fabric. Making sure that there is an overlap from the fold to the backside of the fabric is important because this will make sure that the stitch goes over the raw edge of your fabric, therefore stopping the fraying. If you thread color matches the color of your fabric, you will not need to worry about the thread showing, as you can see below. 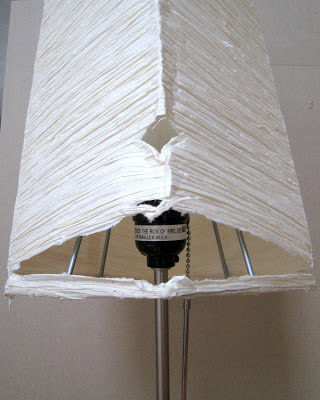 Wrap your fabric around your lamp shade and mark where the fabric will meet. Pin the fabric over to the backside and pin in place. Leave yourself an extra 1/4" so that you can attach the two short ends together to make a tube around the frame. Using your binding stitch, sew as close to the edge of the fold as you can. Next, cut the extra fabric off after you have hemmed the short side. Cutting this extra fabric away will make sure that you don't have an overlap of fabric over your lamp shade, which would be seen when the light is on. Fold your fabric in half, with the backside of your fabric touching. Match up the edges of your short sides together, and pin in place. Using a needle and thread, hand sew the edges together using a slip-stitch. Leave a two inch section at the end, but don't detach your needle just yet. Slip your shade onto the frame. Leaving that two inch section open should give you a little more wiggle room with your fabric and stretching it over the frame. Once you have the shade on the frame, sew up the rest of your short sides. Trim off any little threads when you are finished. Gently rotate the fabric shade around the frame so that your seam ends up on one of the corners. This may take a little more work than you think. Also, be careful around the corners that you have soldered in case you missed a rough spot when sanding. You wouldn't want to make a pull in your fabric now that it is finally on the shade frame! Attach your shade to your lamp, turn it on, and admire your hard work! And there you have it! You should finally be done with your IKEA Orgel Lamp Shade! Now, if you're like me, you'll still have one more lamp to do, but you'll get to it soon. Plus, now that you have done this once, you'll be able to do the second one a lot easier. What do you think of the finished product? I think the lamp came out awesome, and hopefully the cats won't ruin this shade like they did the last! When D and I moved into our first apartment together almost 6 years ago, I took a trip to IKEA to get some furniture and decor. One of the things that I chose for our bedroom were the Orgel Table Lamps. They were cute, and really inexpensive at about $10 each. They were perfect, until we moved to this house. They had survived five moves, but that isn't what ruined them. When we moved to Indiana, we adopted our second cat from the shelter, Oberon. He is adorable, but like most cats, loves paper, especially the noise that it makes. Also, our cats aren't normal cats. They aren't the type where you can put food down and leave it there all day and they will graze. If there is a single kibble that lands on the floor, I can guarantee you that it will be gone in less than five seconds. Our cats are hounds, so they get fed once in the morning and once in the evening. The Orgel lamps from IKEA are handmade with crepe paper. Every morning, if we haven't gotten out of bed before the cats have decided that it's breakfast time, a.k.a approximately 5:00am, Oberon takes his anger out on the lamp, by chomping on it and clawing it. Which leads me back to this DIY. 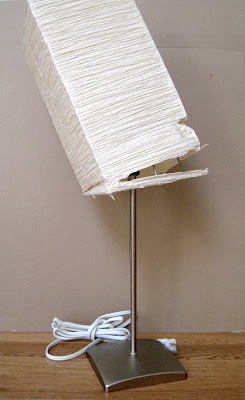 The paper lamp shade was in really really rough condition. The lamp used to sit nicely, as you can see in the picture below. But now, the lamp looks more like this. And a closeup of the rips and full separation from the frame. For a while, I actually used a hair tie that I cut and tied the paper to the frame in order to keep it on and straight, but eventually, other rips formed and the lamp went back to sitting sideways. Instead of just getting different lamps, I decided to redo the existing shades, and change them up a bit. I bought some green linen print duck cloth a while back, and I decided to use it for these lamp shades. One last thing before I get to the DIY part of this project. I have split this up into two different posts. There are a lot of steps to this project, and I didn't want to be too long-winded, so I have this part now and later this week I will have the second part. The first thing that I did to start this project was to take the paper off of the lamp shade frame. Make sure that you get all of the glue and paper off of the frame. You will likely need to use some goo-gone or sandpaper to help get all of the residue off. The frame is technically two pieces and the rigidity of the paper holds the shape in a rectangular tube. Since I will be using fabric as my lamp shades, I needed to do something to attach the two pieces of frame and make it sturdy so it didn't collapse. I decided to solder some welding metal onto the frame. I picked up two 1/8"x4' rods of welding metal from the hardware store and used my hack saw to cut them into 11" sections, which is how tall the paper lamp shades were. You can find the welding metal in the mailbox and sheet metal aisle of Lowe's or Home Depot. It is important to make sure that your pieces are all the same length, as you don't want your frame to be crooked. A hack saw with a metal blade will cut the metal, as will a chisel and a hammer. While I was at the hardware store, I also picked up some lead-free solder and some flux. The solder was over by the power tools, near the welding supplies, and the flux was actually in the plumbing aisle. For this part of the project, you will also need a soldering iron, which can be found in the welding aisle by the power tools, but I didn't need to purchase one since I already had one. Before you actually get to soldering, make sure that your material is dry, clean of dust, oils, and fingerprints, and is sanded down to the raw metal. Now I will show you how to solder. First, using a small brush, paint a generous amount of flux onto the area that you want to solder. You will need to apply the flux to all of the metal pieces that you wish to attach. The flux will prep the surface for the solder to stick and attach your additional pieces of metal. Next, using your soldering iron, heat the metal where you have painted on the flux. The flux will melt and once it starts bubbling, you are ready to add your solder. Make sure that your metal does not cool down too much, because it needs to be hot in order for the solder to adhere. Unwind some of the solder from the roll and melt it onto your lamp shade frame using your soldering iron. Never use the tip of your iron. Always use the angled side and the stem. Once you have a small amount of solder on the frame, take your welding rod and using the soldering iron and solder, attach it to the frame. You will need a second hand to help you hold the welding rod in place while you attach it with the solder. Once the rod is attached from the top, flip the frame over quickly and carefully, and add some solder to the bottom to make sure that the welding rod will stay attached to the frame. If this isn't done immediately after you attach the welding rod to the top, the metal will cool and the solder will not stick. Don't be afraid to add too much solder. You will be sanding it down later to make it smoother, and you can shape it then. Repeat this step for all of the corners of your frame. Don't forget to the flip over the frame and attach the welding rods to the other part of the frame. Once you have all four welding rods attached to both parts of the lamp shade frame, go back and add additional solder as needed. You can add solder to solder without it needing to be hot, but in order to attach solder to metal, the metal must be hot. You may need to reheat your frame or welding rods if they have gotten too cool. Fill any gaps that you may see, then let the frame cool completely. Once the frame is cooled, you can use medium grit sandpaper to gently sand down the solder to make it smooth. This is important because solder can be very sharp and not only do you want to make sure that you don't scrape yourself on the metal, but you also want to make sure that your fabric will not snag on the rough spots. In the next post, I'll show you the steps that I took to make the fabric shade for the frame. It was really simple and quick, and something that you could easily do in less than an hour. Have you ever soldered before? What did you use it for? I have wanted to plant a tree for a while now, and while this won't exactly cross that item off of my 101 in 1001 list, it is a step in the right direction. Avocado trees are not native to this environment, however, you can still grow the tree, but there is no guarantee that it will be fruit bearing. We buy avocados at the grocery store every few weeks, so when D used one in his taco salad the other night, I took the seed and set it aside to plant it. I started out with some river rocks, which I bought from IKEA for just about a dollar. You can also find bags of river rocks at Dollar Tree for $1, or you can just use some rocks from your yard. I didn't have a planter or a pot to plant this in, but I did have some extra vases that I used in my centerpieces at our wedding. I started out making sure that the case was free of dust and oils. If you wash it ahead of time, also make sure that the vase is free of soap residue. Next, line the bottom of your planter or vase with the river rocks. You want at least two inches high of rocks. Having rocks in the bottom will help with water flow in a planter that has holes in the bottom. In a vase, like I am using, this will help you make sure that you aren't over-watering your avocado tree. Add in some dirt to about 2/3 the way up the vase or planter. Gently tap your vase or planter on a hard surface to make sure that the dirt settles in the planter, getting some between the rocks at the bottom. Press down gently on the surface of the dirt to pack it in. Place the avocado pit in the planter. Make sure that the pointed end is facing up, and the larger rounded end is sitting in the dirt, facing down towards the bottom of the vase or planter. Add more dirt, pressing it around the avocado pit and then leaving 1/2"-1" of free space at the top of the vase or planter. Add water to the vase or planter. Add enough so that the soil is completely wet. If you have used a vase, all of the dirt should be wet, and your rocks should be sitting in some water at the bottom. If you are using a planter, wet the soil enough so that you have a stream of water coming out of the bottom of the planter. Place your planted avocado pit in a sunny location indoors, and water as needed. And now, the waiting game begins. From what I have read, it will take about three to six weeks for the sprouts to grow. I'll make an update when I finally see progress on my tree, but for right now, I'll just keep watering it. Have you ever planted an avocado tree? Aren't the leaves beautiful!? For my kitchen, I wanted to find an easy solution to storing my kitchen knives. I already had an actual knife block for a set of J.A. Henckels knives that D and I received as a gift before we move in together, but all of the slots were taken. I was constantly throwing the knives in a drawer, but realized how inefficient and unsafe it was, not to mention how bad it actually is for the blades. So, I started brainstorming and thought, how about a magnetic knife block? I came up with this DIY and found the perfect spot in my kitchen to store the knives, so I got to work. First, I found a spare piece of 1"x2" wood that I had used for a different project. I cut the wood to be about 12" long. Next, I covered the wood in white contact paper, but if you don't have any on hand, you could always just paint it the color that you wanted. Decide which side of the block will be the front, and add adhesive magnetic strips. You will want more than one strip of magnets, as you want to make sure that your heaviest knife will stay on the block. Space them evenly on the block for visual appeal. On the other side of the block, attach double-sided foam. The double-sided foam will be strong enough to hold the knife block on your wall or cabinet, however, it can be removed if you would like to change the location of the block. If you are looking for a more permanent solution, you could screw the block to the surface of your choice, or use a silicone adhesive. Choose the location for your knife block. Measure out the location and mark a line using a level. Peel the paper backing off of the foam strips, or add your adhesive, and stick the knife block to the wall, using your level line as a guide. Press firmly for about one minute to make sure that the adhesive has attached to the surface. Pull slightly on the knife block to make sure that the block has enough strength to hold your knives. Add more adhesive if necessary. Once your block is secured on your wall or surface, add your knives and admire your work! This quick project will help you make a big difference in your kitchen, and give you a great place to store your knives. And for me, since I had everything on hand, this project was free! Have you made yourself a magnetic knife block? Will you now? That's a lot of Mulch!